Slime mold was grown on an agar gel plate shaped like America and food sources were placed where America’s large cities are. The result? A possible look at how to best build public transportation. 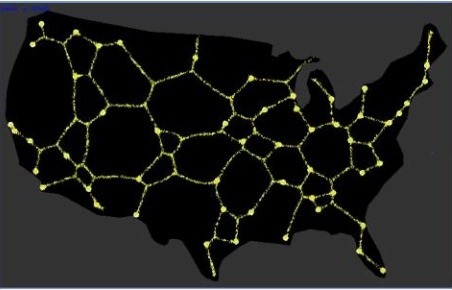 I just really like the idea of slime mold on a map of the US. It’s beautiful. I have a raging science ladyboner right now. I’d love if we could do it on a state-by-state basis. That same slime mold once affirmed that the Tokyo subway is pretty well-designed. Using slime molds as a calculator. Natural computation: it’s a thing, and it’s awesome. What is the universe but a really, really complicated computer?